In the spirit of keeping it real (and hoping I don’t lose my credibility), I want to remind you all that sometimes, a meal can taste absolutely delicious no matter what it looks like. Keep reading…you’ll see what I mean. 1. 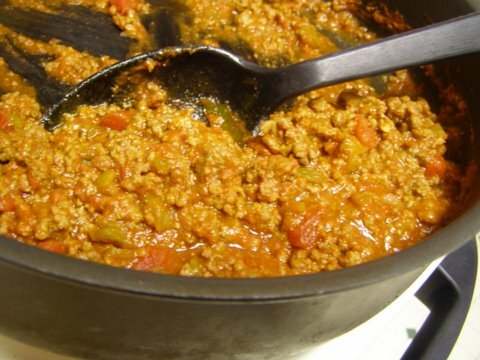 Cook the ground beef and onions in a large skillet until beef is fully cooked. Drain. Stir in the seasonings, water, tomatoes and chili peppers. Bring to a slow boil and simmer until thickened. 2. 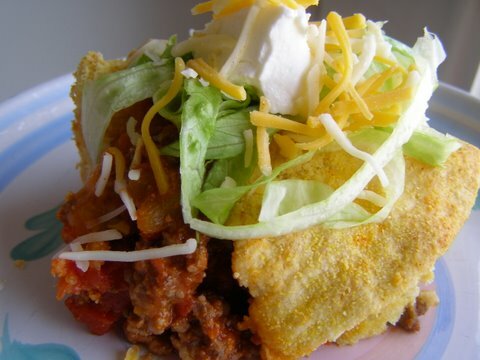 While the taco filling is simmering, combine the flour, corn meal, baking powder and salt. Cut in the butter or margarine until crumbly. Stir in the milk just until dough is moist. Knead about 8-10 times. 3. 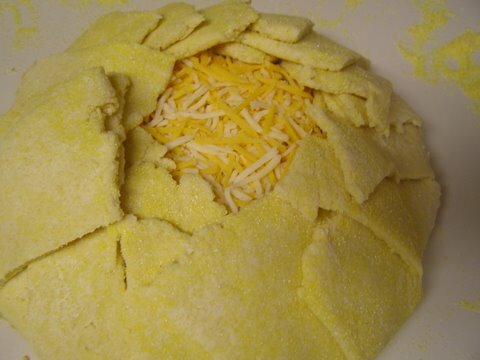 Sprinkle your work surface with cornmeal and roll dough into a large circle. 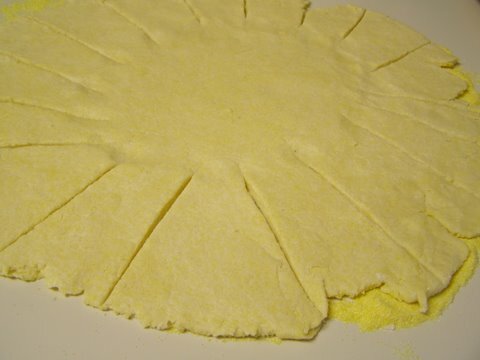 Cut strips around the edge of the dough that go in about 1/3 of the way. 4. Here is the absolutely crucial step that must be followed – move the dough to a cookie sheet!! Then, and only then, spoon the taco filling into the center of the dough. Top with a cup of shredded cheese. 5. 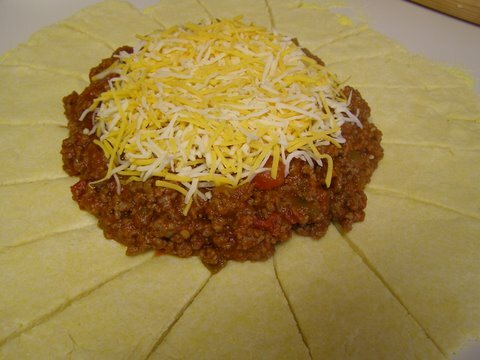 With the dough and filling on the cookie sheet, fold in the cut out strips of dough. 6. If you have followed steps 4 and 5 exactly as written, place the neat and tidy (and oh so pretty) taco pinwheel on cookie sheet in a 375 degree oven. 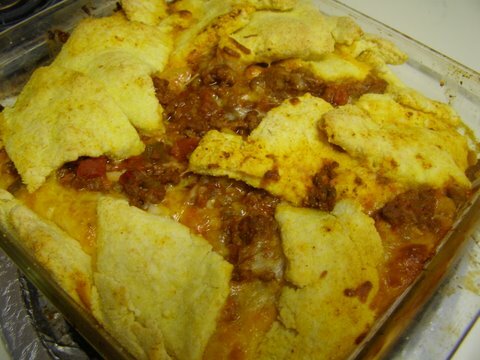 Bake for 20-25 minutes, until corn biscuit crust is lightly browned. Serve the beautiful masterpiece and impress everyone at your table with your culinary prowess. 7. If you are an unfortunate sap who lacks forethought, you’ll have a beautiful taco pinwheel sitting on your counter waiting to be placed on a cookie sheet. You’ll think to yourself, “hmmm…maybe I should have assembled this on the cookie sheet. Nah. It will lift easily enough.” You’ll try to lift it with your hands and the whole thing will start collapsing in on itself. So you’ll grab a spatula that won’t help at all. Then you’ll try and contort your cookie sheet in every possible way that a cookie sheet can be contorted. 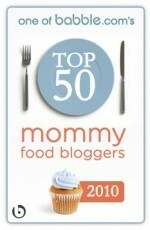 Because this needs to look good so you can post it’s beauty on your cooking blog!! Eventually, you’ll give up in disgust, grab a casserole dish and just plop the whole messy concoction into it. Ask me how I know. Stop by Life As Mom for the Ultimate Recipe Swap. Oh !! you Got it down , You are so VERY creative , I would never have thought of it THAT way !! Thank you for taking the time to share with us. Wow! That looks so pretty and yummy. This looks SO good and I can’t wait to try it! It sounds very yummy and forgetting to put it on the cookie sheet before assembling is something I would probably do too. As long as it tastes good it doesn’t matter so much what it looks like to me. This sounds delicious! Thanks for sharing despite the oopsie… We’ve all been there. I love the new look, too! Very nice. Beautiful site…wonderful recipe! I am excited to try this recipe for next week’s menu. I’ll let you know how it turns out! Thanks!! Kate ~ doesn’t every cook have a day like that once-in-awhile? Good for you for salvaging dinner. My whole life is step number seven! This looks totally scrumptious and I *must* try it! Yum. Tacos aren’t really my thing. But I had to comment — I love the new look! It’s wonderful. You are too funny! It looks very pretty on the plate with all the toppings. LOL- I seriously laughed reading your post- all the talk about the spatula and cookie sheet. Ahh- it is totally something I would do. Looks good though- if I could actually make pie dough . . . It sounds and looks really good, though! You cook like me (only I’m betting your much better) in stollen moments and without the available time to plan ahead. Fun story! 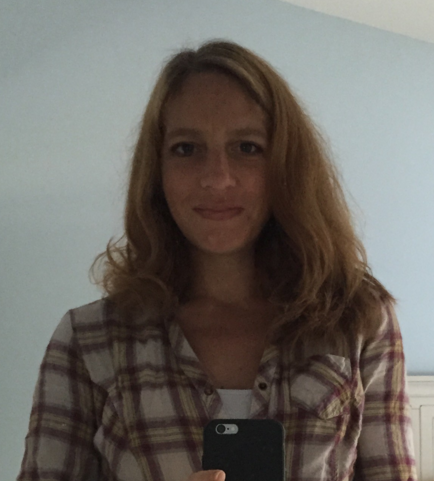 Kate – This was delicious! I made it for dinner last night and I even ate it for breakfast this morning! I assembled it on the baking sheet and it still wasn’t cute. Biscuits are my arch nemesis, so that could be part of the problem. I can never get it right. I had to add quite a bit more milk to get the right consistency, then it was a little over worked. It tasted amazing, though. *LOL* THat sounds just lie something I’d do. These are the moments that one realizes how truly normal we all are. Thanks for the giggle. oh yeah – and I am totally going to make this SOON! I made this tonight and it was very good! I also had to add more milk into the biscuit mixture to get it to come together. It looked pretty and tasted wonderful! Thanks! I just made this for dinner tonight and it was delicious! I had some canned chopped jalapeno I needed to use up so I used that in place of the green chiles, but other than that I followed your directions (especially the part about moving the dough to the cookie sheet!) and it was delicious! Thank you! 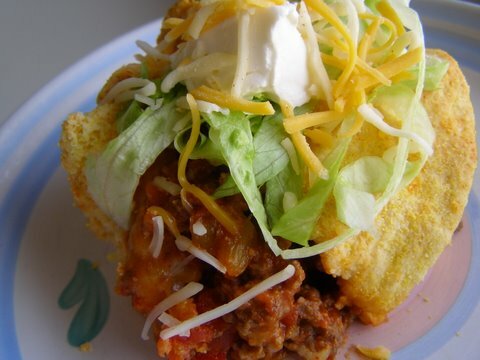 I just made this for dinner tonight and it was a HIT!! Loved how the crust came out. I was really afraid it would be super sweet like cornbread or a tamale. But, it was light and crunchy adn oh so good. We will definitely make this again. The only thing I have to say is my littler ones thought it was a little on the spicy side, so next time I might cut back a little. We love this, but I have a problem with my crust. I cannot get it to look like a beautiful pie crust, like yours. How do you do it? Mine is crumbly or too hard to roll out & far from a circle. Any tips would be greatly appreciated. I’ve pobably made this 3x now & have the same problem every time.